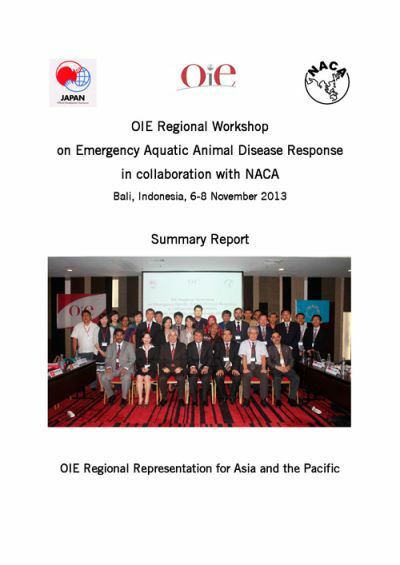 The OIE Regional Workshop on Emergency Aquatic Animal Disease Response was organised in Bali, Indonesia from 6 to 8 November 2013, in collaboration with Network of Aquaculture Centres in Asia-Pacific. Total of 35 participants including country representatives from Bangladesh, China PR, India, Indonesia, Japan, Korea RO, Myanmar, Philippines, Sri Lanka, Thailand and Vietnam attended the workshop. The programme for the first two days of the workshop was dedicated by country reports on current aquatic animal disease situations in the selected countries and presentations on the national aquatic animal health programmes of China, Japan and Korea. In addition, case studies on the molluscan diseases (Akoya Oyster Disease and Soft Tunic Syndrome), shrimp diseases (Acute Hepatopancreatic Necrosis Syndrome, AHPNS) and finfish diseases (Koi Herpes Virus) were presented to facilitate the subsequent discussion on emergency response of those diseases in the national and regional level. The workshop highlighted the importance of Asia-Pacific region in provision of protein-based food to global population since it covers the 90% of global aquaculture production while having the diversified aquaculture system and huge numbers of aquatic animal species. Consequently, there is a high risk of the transboundary spread of aquatic animal diseases by the trade-related movement of live aquatic animals. The participants were reminded that “prevention” is the best way to protect the aquatic animals from the diseases. 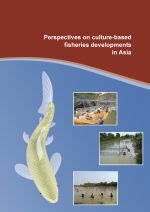 This might be achieved by a combination of various efforts such as sharing information of disease situation, conducting import risk analysis according to the OIE Codes and Manuals, application of OIE PVS Tool:Aquatic and TG, and implementation of Best Management Practices (BMPs) and Good Aquaculture Practices (GAPs) as a part of National Aquatic Animal Health Programmes. Taking into account the huge economic impact of recent outbreaks of emerging diseases in the region, for instance for AHPNS, the workshop recommended the need of international interventions for the improvement of capacity building activities and application of international standard and guidelines for the emergency disease response. The workshop also informed the member countries to be encouraged to apply the OIE PVS tool:Aquatic to improve their national aquatic animal health management programmes.